Record Store Day: 3 great music systems for playing vinyl | What Hi-Fi? Your hi-fi’s sonic excellence cannot live and die on the quality of its turntable alone. It’s crucial that each component in a decent vinyl system makes its own case for inclusion in the line-up and, most crucially, complements the other members of the team. Here, then, we give you three complete music system options, at differing price points, that we’re sure won’t disappoint. So with Record Store Day around the corner, whether you're operating on a tight budget or you're ready to splash a serious amount of cash, you’ve got no excuse not to make the very most of that precious vinyl collection. Which is where our first system comes in. The wizardry of the Juke Box E, with its internal amplification, means that you can’t really get a simpler turntable system than this. You’ll be opening only two boxes to get your hi-fi up and running, rather than the four or five you might need to break into for a traditional system with (possibly) pre-amplifier, power amplifier and separate phono stage. Not much could be simpler than this: put your Juke Box on a solid, vibration-free, level base and connect it to a pair of stereo loudspeakers. And that’s it; stick a record on the platter, and you’re good to go. What’s more, you’re not compromising on sound a great deal (if at all) over an equivalently priced separates system. There are a number of excellent speakers at an appropriate price to go with the Juke Box. We’re tempted to go with our Award-winning Monitor Audio Bronze 2s or the excellent Q Acoustics 3020i, but we’ve plumped for Elac’s superb Debut B5.2 – a model we’ve said should be considered one of the company’s finest efforts. We step up in price here to a more conventional record deck/integrated amplifier/speakers system, using Audio Technica’s AT-LP5 as our source. This is an interesting turntable: it will play your vinyl impressively well, has a decent phono stage built-in, and will also allow you to make a digital copy of your vinyl music, via its USB output, to store and play wherever you wish. Handy. Most importantly, of course, for a main system source, is that – while you’re taking advantage of all its abilities – it sounds great. Our choice of integrated amplifier at this level is a no-brainer. Marantz has rather excellent form at this price point, and the Award-winning PM6006 UK Edition improves on an already extremely competent model. As well as doing the best job you can buy at £329, the PM6006UK has plenty of inputs for all your other equipment, including a tape loop for recording, should you so desire. To round off this impressive, sub-£1000 system, we present Dali’s really rather excellent Oberon 1s. These petite standmounters are absolutely stunning with vocal-based material in particular – they’re nicely judged tonally and impressively confident and composed. All of which makes them the perfect accompaniment to the Audio Technica and Marantz combo. At roughly twice the price of our second system, this trio needs to represent a significant improvement in quality; and, of course, it does that – comfortably. We’re in the realms of serious hi-fi here. 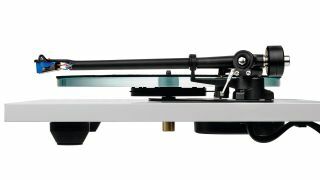 Rega’s legendary Planar 3 turntable has pretty much dominated this sector of the market for around 40 years now, though it has evolved over that time, of course. This latest iteration has improved on its predecessor in pretty much every area – and looks the part as well. Most important is the sound it produces, and it’s here that the Planar 3 and Elys 2 cartridge combination really shines, with terrific transparency and detail resolution combining to make for a really engaging listen. It’s no real surprise that the turntable enjoys impressive sonic synergy with Rega’s Brio integrated amplifier. This 2018 Award winner is another Rega update of a long-running favourite (the first Brio was launched in 1991). And this version will belt out a punchy, detailed dynamic sound with a fine sense of rhythm. It goes loud – and it’s thrilling. The Rega pairing deserves some top-quality speakers to make it sing, of course, and Bowers and Wilkins’ new 600 series provides them in the shape of the 606 standmounters. These £550 speakers deliver a beautifully balanced sound that complements the Rega duo beautifully. Bass is tight and insightful, and the sound of this system draws the listener in like little else at this sort of money.